172 pages | 5 B/W Illus. “Digital culture” reflects the ways in which the ubiquity and increasing use of digital devices and infrastructures is changing the arenas of human experience, creating new cultural realities. 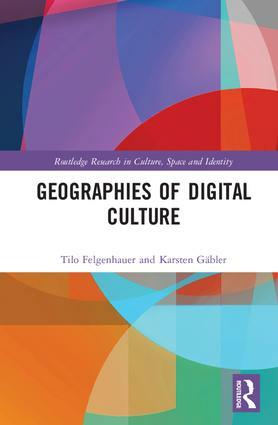 Whereas much of the existing literature on digital culture addresses the topic through a sociological, anthropological, or media theoretic lens, this book focuses on its geographic aspects. The first section, “infrastructures and networked practices” highlights the integration of digital technologies into everyday practices in very different historical and geographical contexts—ranging from local lifeworlds, urban environments, web cartographies up to global geopolitics. The second section on “subjectivities and identities” shows how digital technology use possesses the capacity to alter the subjective, perceptive, and affective engagement with the spatial world. Finally, “politics and inequalities” investigates the social and spatial disparities concerning digital technology and its use. This book draws attention to the deep interconnectedness of the cultural, digital, and spatial aspects of everyday practices by referring to a broad range of empirical examples taken from tourism, banking, mobility, and health. Scholars in human geography, anthropology, media and communication studies, and history will find this research indispensable reading. It addresses both young and seasoned researchers as well as advanced students in the aforementioned disciplines. The wealth of examples also makes this publication helpful in academic teaching. Tilo Felgenhauer is lecturer at the department of social geography at the University of Jena, Germany. Karsten Gaebler is lecturer at the department of social geography at the University of Jena, Germany.